Momentum is powerful and addictive. It can be hard to perform a selling analysis on a company that has been so good to you and your portfolio that you’re considering naming your next child or grandchild after the company. We’ve often wondered if we could build a monitoring method that could use relative strength indices and overbought breakdowns as another component of our portfolio-centered approach that is based on return forecasts and quality rankings. We continue our exploration and vigilance using these long-term charts, starting with the company with the highest RSI at this time, Pfizer (PFE). The case studies will also include McDonald’s (MCD), Stryker (SYK) and Apple (AAPL). Pfizer (PFE) has delivered a fairly massive advance — during a period when it went “non-core” with low and uncertain growth expectations over the last several years. The stock price has basically tripled in four years. We’re reminded that a company can maintain an overbought condition (RSI>70) for months and even years … but we’ll be monitoring PFE going forward for the day when an excursion takes it to a value less than 70. 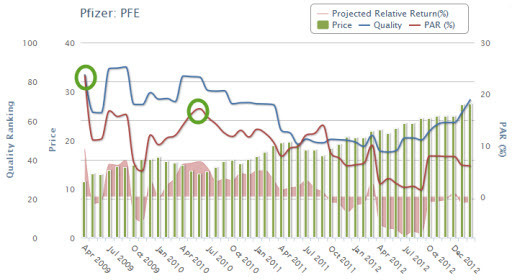 Just for kicks, a side-by-side comparison of the chronicle for Pfizer (PFE) displaying the elevated return forecasts at the price bottom, the convergence point (mid-2010) shown in the preceding image … and a steadily improving quality ranking. So … are any of the stocks in neighborhood of 70 displaying “breaks” below 70 — making them sell consideration candidates? We’ll start with the companies with return forecasts (PAR) less than the market median (MIPAR) at this time. We see that five companies cry out for a closer look. And since these would be more “challengeable” in portfolios (more likely to reside among the lower PARs in portfolios), it’s probably prudent and timely to do this on a continuing basis going forward. 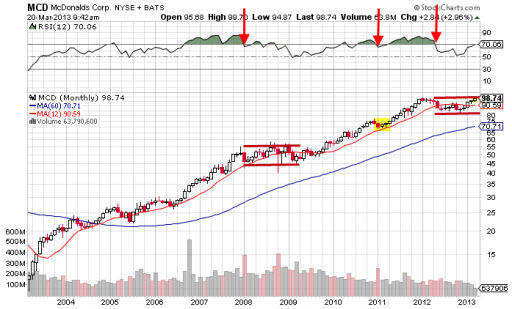 The long-term RSI for 3M Company (MMM) is still increasing. We’ll be watching. McDonald’s (MCD) is interesting. I hope none of you mind while I “think out loud” while trying to learn and decide with respect to the long-term potential value of monitoring from this perspective. 1. 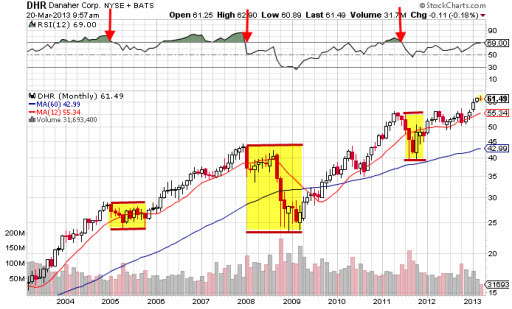 I’ve shown three of the RSI breaks since 2008, denoted with the red arrows. 2. The concept is that we’re not surprised to see either a stock price decline or a disruption accompanied by an “extended trading range” following one of these turbulent disruptions. 3. The magnitude of the stock price correction and/or duration of the trading range seems to be somewhat proportional to the amount of geometric area (shaded green) preceding the price break. Note the subdued disruption in late 2010/early 2011. 5. I need to do more research regarding the RSI=50 level/threshold. 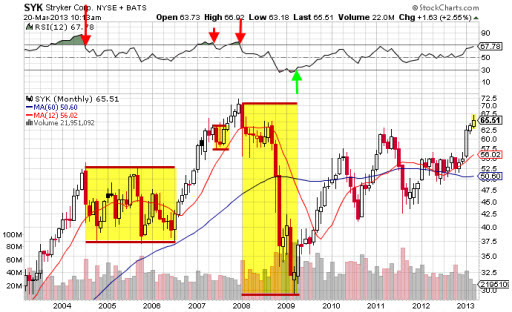 Are the “reflections” or bounces at RSI=50 typical? Is there a chance that these reflections are signals (see mid-2009 and 4Q2012 & subsequent price advance) that the extended trading range could be waning or ending? I hope the Danaher (DHR) 10-year chart will help illustrate why we’re scratching our heads over this. The magnitude and duration of the price corrections following the RSI breaks on this chart seem to be quite “proportional” to the overbought areas. Community favorite Fastenal (FAST). It’d probably be fascinating to take a look at community sentiment (particularly the hand-wringing variety) during the relatively few disruptions over the last ten years. Note that FAST navigated/mitigated the bear market period exceptionally well during 2008-2009. Leave it to community favorite Stryker (SYK) to be among the most colorful of this stroll. 1. 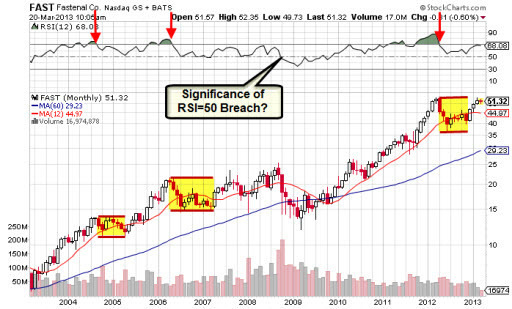 The RSI, although near 70, is still an increasing trend. 2. Stryker (SYK) spent an extended period at the top of the MANIFEST 40, fueled by accumulation trends following that price correction in the middle of this display. And we’ll wrap up for now with the $64,000 question and one that many of you are waiting for: What does Apple (AAPL) look like? 1. Apple is the most widely-followed stock in the MANIFEST 40. 2. The strength of that long-term (5-year trailing average) is massive. 3. 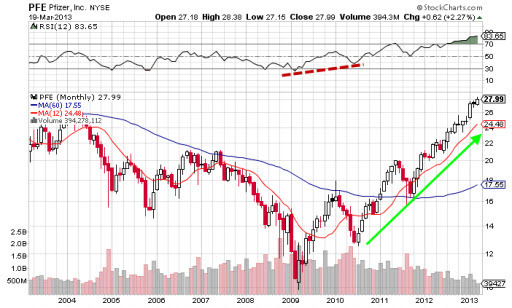 That leads to a situation where AAPL was “potentially overbought” for a significantly extended period. 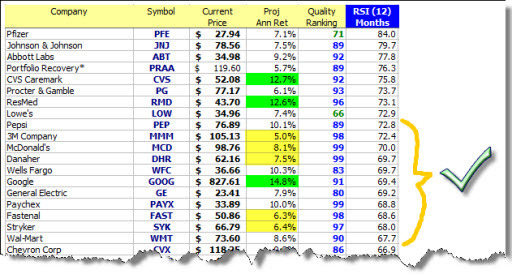 See the RSI area from early 2010 to late 2012 — a period of over two years. This serves as a powerful reminder that under the right conditions, a stock can be overbought for a long time. 4. The area of the disruptions (stock price decline in combination with the duration of the trading range) does seem to correlate with the RSI areas and sharpness (rate of decline) of the overbought RSI condition. During the most recent Round Table I was asked if I would sell (or buy) Apple as a long-term investor. My short answer was that I didn’t think it was time to buy (yet). We also want to point out that we strongly urged a trailing-stop mentality (if not programmed stops) for Apple in a series of articles a little over a year ago. Those of you who heeded that suggestion, you’re welcome. This series of charts provides my longer answer to the question posed by the webcast attendee. 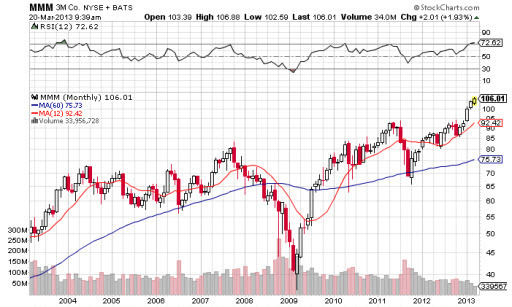 Take a look at the current area of disruption on display here for AAPL. 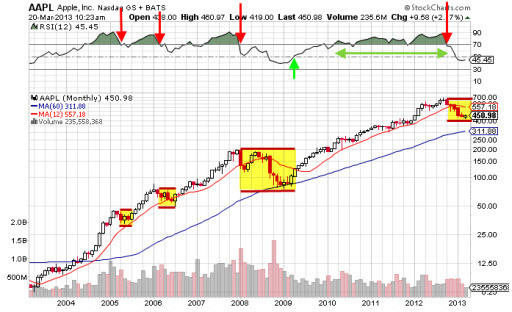 Compare the preceding overbought RSI area, rate of RSI decline, etc. for the previous corrections. The extended period where RSI>70 leads to a pretty good size green-shaded area with an amplitude similar to previous episodes. I think the yellow-shaded area is going to get materially larger for AAPL as this chart rolls forward. The only way for that to happen is for either (1) a continued price drop or (2) an extended trading range … or (gulp) a combination of both. We’ll certainly be watching for a gain back above RSI=50 that is sustained. But I think it’s far more likely that the stock price for AAPL could continue to decline to the point where RSI is less than 30. I’d be vigilant for price surges to the upside to reduce my position over time — all the while waiting for the reversals that will put an end to the disruption area shown here. 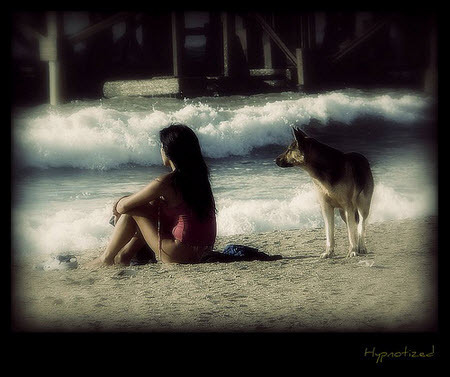 We’ll continue with more long-term RSI snapshots in the Manifest Investing forum and will certainly flag any that deserve to be “flagged” and hope that any ensuing hypnosis will lead to focused vigilance … and an incremental benefit to our long-term returns.